As Capt. Z said himself, "At that time I had no use of either hand. I know how humbling it is, how humiliating it feels. And I know how much better I felt, how amazingly more functional I felt, after Soldiers' Angels provided me with a laptop and a loyal reader provided me with the software. I can't wait to do the same, to give that feeling to another soldier at Walter Reed." Donations sent in the mail should be sent early on as they must be received by Nov 11 to count towards the contest. Include your team name (ARMY, NAVY, etc.) with the donation so that your team receives credit for it. 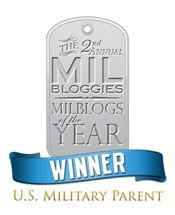 If you have read this site, you know the heartache and worry that military families endure while their service members are deployed... and you know how imperative communication between the soldier and his/her family is... So I ask you to whole-heartedly and completely endorse this incredible project that assists our wounded soldiers, sailors, airmen, and marines ... Help them reconnect with the world using technology. Give a donation in your name, your grandfather's name, your Dad's, your brother's, sister's, friend's... or just because you are glad that there are others out there willing to serve to protect you and yours! Note: The money raised during this little contest will be used to acquire this technology for wounded service members regardless of their branch of service -- the competition is just to see which branch can raise the most money! And finally, every donor during this time will receive a Soldiers' Angels Coin. Attn. Bloggers: Join Us! 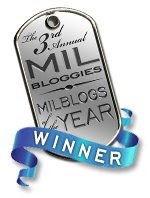 You don't have to be a milblogger, either -- just spread the word -- copy and paste from here or Blackfive's site... Anything to spread the word!!! As I said -- OK, It's GRUNTS v. JARHEADS V. SQUIDS v. ZOOMIES! Let's get to it! Cool post SSmom. Did you ever think of going into advertisement. Only you can say it so good. Your post looks super, SSM!! I'll post IT tomorrow! Thanks! Hi SSM, I was just thinking of you and yyour soldier. I hope and pray all is well?